Richard Factor, of Little Ferry, NJ (I did not know he was from NJ until after I submitted my choices as a judge) won one of the prizes: an N6705B DC Power Analyzer with three modules installed. Quite a nice prize, and well deserved based on Richard’s entry! Simon Jensen of Husum, Germany, also won an N6705B for his entry. Simon’s entry was chosen by readers of the stories who voted for their favorite. Simon used an Agilent 6632B power supply as an inexpensive load to sink current from a switching power supply he built. As Simon correctly points out, the nameplate on this power supply does not reveal all of its capabilities. It says 0 to 5 A, but it can also sink a programmable, regulated current like an electronic load. So the nameplate should say -5 A to +5 A, as pointed out by Simon! 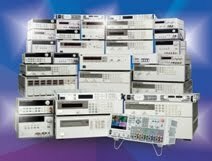 Having worked for HP/Agilent on power products for more than 32 years (since 1980), it was not too surprising for me to see so many interesting applications for our products. I was also delighted, and not too surprised, to see how many of our older power supplies are still out there, providing power, decades after they were introduced! Now that’s what I call “vintage voltage”! !